Fournier’s gangrene is a rare but life-threatening, special form of dermal necrosis located in the genitourinary region. Mortality rates range from 4% to 43% in actual series (Dahm et al. 2000; Mindrup et al. 2005; Yeniyol et al. 2004; Korkut et al. 2003; Burdal et al. 2003; Chawla et al. 2003; Asci et al. 1998; Nisbet and Tompson 2002; Corman et al. 1999; Korhonen et al. 1998; Hollabaugh et al. 1998; Benizri et al. 1996; Palmer et al. 1995). The main treatment principle is an immediate, extensive debridement of the entire necrotic tissue under concurrent broad-spectrum antibiotic therapy. Reconstruction can be performed only when the wound is free from infection. 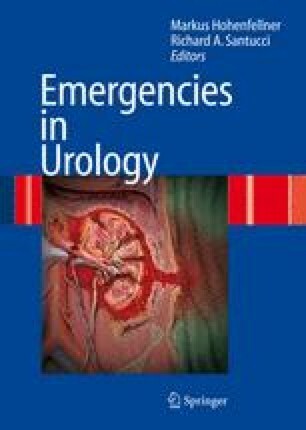 In this chapter, we report a case of Fournier’s gangrene caused by the deterioration of the blood supply caused by scrotal rings and discuss etiology, symptoms, and treatment of Fournier’s gangrene.